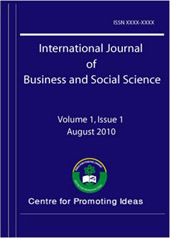 The journal is published in both printed and online versions. IJBSS publishes original papers, review papers, conceptual framework, analytical and simulation models, case studies, empirical research, technical notes, and book reviews. Special Issues devoted to important topics in business and social science will occasionally be published. Business innovation and research strategies, tactics and tools of both theoretical and practical nature are welcome. Importance of Cross-Cultural Empathy in Selling – Perspective from Asian Indians living in the U.S.